Dale Roberts is Vice President, Professional Services and a member of the founding circle of Artesian Solutions, an innovator in social CRM. He engages with clients on the effective use of social analytics and big data to strategically support sales and marketing. Prior to this, he advised global businesses on analytics and organisational decision making for two decades, one of which was as a European Services Director for market leading analytics provider, Cognos. Rooven Pakkiri is a digital evangelist focusing on how social technology is making fundamental changes to the way we think, communicate and work. Rooven runs regular thought leader events and truly innovative digital shows to help companies and individuals to understand social business. He also speaks at industry events on this subject. We are living in the post Information age, the era of so-called Big Data. It is a practical possibility for corporations to report, chart and analyse every action and click that happens inside and outside their business. Roberts and Pakkiri examine what this means to organisational decision-making and explode the myth that smart decisions need only be informed ones. In an era when Big Data allegedly offers the answer to every question, Roberts and Pakkiri boldly assert that all decisions are made by human beings, who are often more influenced by the people they trust than the information they read off screens. Business decision making is ultimately a Social activity; management and execution of business goals will improve only when we act on this insight. We routinely make decisions every day. How we inform them and how we handle them seems to be cut and dried. However, Roberts and Pakkiri challenge the traditional thinking. 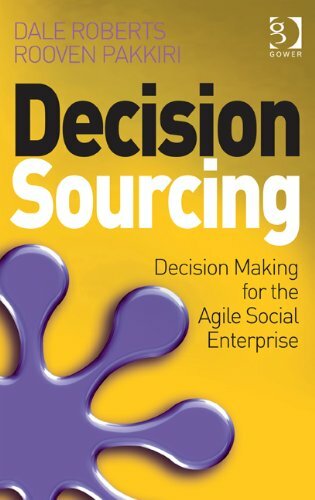 This book examines the sources of decisions in a fresh way. They show how businesses can utilise social channels to make decisions and arrive at outcomes that might not otherwise have suggested themselves. The results are often surprising and sometimes amazing. This isn't just about business decisions, it is about all those decisions we make in life. I would not miss this book if I were you. So make your last 'old school' decision. Buy this book. Right now. Easy decision.